Mexico has given the world many wonderful gifts - think mariachi bands, Cinco de Mayo, chihuahuas - but it’s greatest achievement may also be its most overlooked: the flour tortilla. 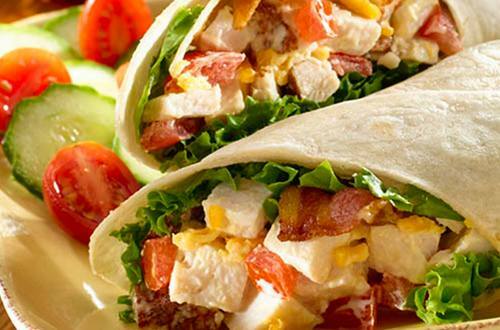 In this recipe we take this staple wrap and mix it up with turkey, cheddar, bacon, lettuce and mayonnaise to create the ultimate in fusion food. 1 Take a microwave-safe bowl, and in it mix the Cheddar, Hellmann's Real Mayonnaise and sour cream for a winning cheesy combo. Microwave on full power for twenty seconds, then take out and stir in the turkey, tomato and diced bacon rashers. 2 Place the lettuce leaves in the centre of each tortilla, then drop a large tbps of the mixture onto the bed of lettuce. 3 Roll up and secure with toothpick. Slice in half diagonally and serve. Mind the toothpicks when you and your compadre are chowing down.